Hauntingly beautiful, this novel-length biography recounts the story of New York Times investigative reporter Nicholas Gage's mother. Eleni lived her entire life in the tiny Greek mountain village of Lia. Alone, she reared five children amid the mid-century maelstrom of World War II and the ensuing civil war in Greece. 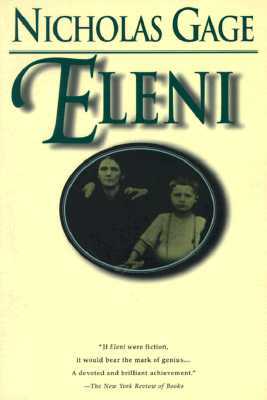 Eleni is a woman worth knowing, and her son describes the events of her life with eloquence. His anger at her communist executioners and at the neighbors, who, out of fear or malice, betrayed her, drove Gage to return to Greece in search of vengeance, a story that this book also tells. Nearly half a century after his mother's death, Gage writes, ''My mother's love, the primary impulse of her life, still binds us together, often surrounding me like a tangible presence.'' Gage conveys that ''tangible presence'' so well that the reader comes away touched likewise by Eleni's love, and emboldened by her courage. Light cover wear, firm binding, age-toned text.